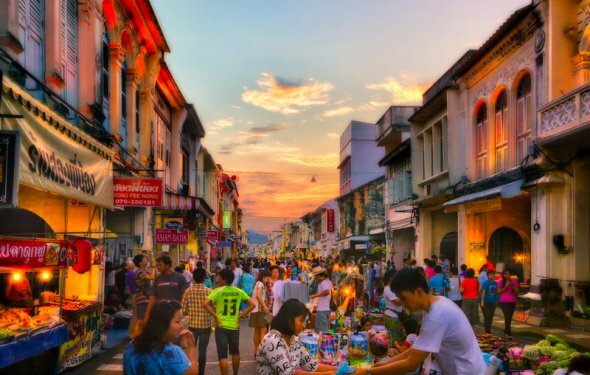 Phuket was one of the major Peranakan Chinese cultural centrals, along with Singapore, Malacca and Penang, thanks to the dramatic growing of tin mining business in early 19th century, luring in a large number of Chinese merchants from the China mainland. It was led to the constructions of Sino-Portuguese mansions and shophouses in the Phuket town. These buildings were the residence of tin mine tycoons, and their descendants, featuring unique Peranakan architectural styles. Each shophouse look narrow from the front but its space spans as long as ten meters or more to the back, making there’s a vast space to accommodate a lot of people. Walk along the roads of Dibuk, Phang-Nga, Yaowarat, Thalang and Krabi to admire the beauty of crafted facade of the remaining shophouses. Some of them are now open as a boutique hotel you can also try lodging. For an in-depth history of Peranakan culture in Phuket, you might want to pay a visit to Phuket Thai Hua Museum.